After enduring years of a struggling marriage, Ronnie Farnham has decided to divorce her husband and is beginning to hope for a happy future--until the morning Jeff is supposed to move out, when he locks himself in their barn with a rifle. When a massive police presence arrives to control the 12-hour stand off, the women in Jeff's life are pushed to their breaking points. 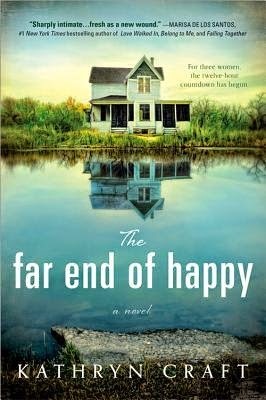 Based on the author's harrowing personal story, The Far End of Happy is a powerful novel about the way one man's spiral towards life's violent conclusion tests the resolve, love, and hope of the women he will leave behind. The strangest part about writing fiction based on true events has to be reinventing your self as a character. While I have much in common with the protagonist in The Far End of Happy, we are not the same person. One of my first tasks in deciding to novelize was to ask which of my characteristics to keep and which to change. This turned out to be a tricky exercise because I am a relentless meaning seeker. What would my main character look like? What occupation would she have? Would she have two sons aged eight and ten as I did, or a bigger or smaller family? Why had she chosen her husband, and when did things start to go downhill between them? What relationship might any of this have to parenting decisions made by her mother and father? Such questions suddenly had me reconsidering every decision I had made in my real life. Most importantly, what kind of goal could this me-like protagonist have for the story, and what motivated this deep need? I don’t know about you, but I’m often the last person to truly understand my own motivations. In real life, we humans are extraordinarily complex. I read through old journals and wrote longhand again to simplify backstory motivations, identify closely held beliefs, and conjure a story goal that her husband’s actions would complicate: she needed to move on, and he determined to stand off. A character through-line fell into place. My choices for the story grew meaningful. Until, that is, I butted up against the most curious exercise of all: renaming myself. Turns out pleasing my meaning-seeking nature wasn’t easy. I wanted a masculinized version of a female name to suggest, subtly, that my main character was functioning as both mother and father to her children. I began with Michelle. I’d always loved the name, thanks to an adorable girl I knew as a kid whose braids and freckles I coveted. I could call her Mick/Michelle! It worked. Right up until page 75 or so, where the backstory first referenced “Mick and Jeff”—which sounded so much like “Mutt and Jeff” I had to abandon the choice. Discouragement set it. This naming felt too random. Then one day I was thinking of my husband Ron, the model for The Far End of Happy’s Jeff, and how his mother and co-workers called him “Ronnie.” Yes—I could name her Veronica/Ronnie. At that moment the entire project clicked into place for me. By naming her Ronnie, I could achieve that thing story does best, and create meaning from the chaos our lives had become that fateful day. Oddly, I latched right on to the notion and never grew confused during the writing. It was healing for me to write about the standoff in a way that allowed someone named Ronnie to experience the end of the marriage, the financial disaster, and the standoff’s extreme challenges without ever losing her willingness to embrace life and all it had to offer. Fantastic post! The book has been getting great reviews on Amazon and Goodreads. Thanks for sharing, Kristin. Thanks for sharing my book Kristin! Much appreciated.